On the same day I ran across two very different people. One told me she knows it’s been a great day if she loses track of how many times she has said thank you (either in her head or out loud). If it was too many to count at the end of the day, that’s her idea of an awesome and successful day. Well, that’s not true, I have a lot of words. Especially if it means a safe landing. 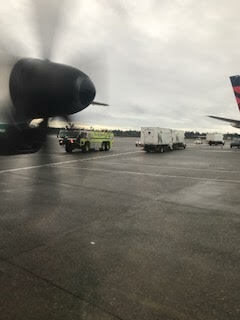 (This particular flight we had emergency crews standing by because ‘the flaps were stuck’). May your day be filled with too many ‘thank you’s’ to count! This entry was posted in Leadership, Newsletters, Personal Growth, Positivity, Relationships, Success principles and tagged communication, e-news, personal growth, Stephanie Staples, success principles, Your Life Unlimited. Bookmark the permalink. Previous Previous post: What Is Your Relationship With Time? Next Next post: Are You Sensitive?